Last night, I had the privilege of personally listening to mission-centered testimonies shared by a wonderful couple. The interesting thing is, this brother is neither a full-time Christian worker nor a pastor or a preacher, not even a bi-vocational worker leading a church. He, along with his wife, is a simple believer but devoted to God’s mission. This young brother is working in a Muslim populated and prosperous country. He works for an automobile company and is living in this rich nation for a couple of years. Multitudes of people, including Christians, particularly from the Asian countries, leave their hometown and go to this country. Do you know why? To earn wealth, acquire material possessions, buy good property in their hometown and then return back to their native place at their convenient time to settle comfortably with their family. But this brother is quite different. He is not material-centered, earthly-minded and comfort-oriented. His passion is, as he works, he wants to support his family and get engaged in the spread of the kingdom of God. He seeks to win the lost. He is burdened to make disciples. He loves to build the body of Christ. And to do all these in a hostile nation, he is utterly dependent on God, has given himself to prayer and uses God given opportunities to share his faith and to make disciples. He does this out of personal burden in the Lord without support and motivation from any church or organization. As I listened to him and learned how God is using him to be a tremendous blessing to many, I saw how he is overflowing with the joy of God as he is engaged in God’s mission. Despite holding a job which keeps him quite busy, he still takes time, particularly using his weekly off, to actively minister to people. How many I find trying to give excuses for not being active in ministry! But we learn from this brother - where there is passion, there is a way. Candidly speaking, I don’t witness such passion to live for the glory of God even among many Christian leaders and full-time Christian workers. Coming to this brother’s wife, she is just a housewife. Unlike many housewives who enjoy cooking, television and shopping, she is more passionate to involve in God’s mission. So, besides fulfilling her household chores, she spends more time in praying for the lost, does prayer walk and loves to use opportunities to share the gospel with neighbors and strangers. She is zealous to impact lives for Christ Jesus. As I listened to their testimonies, I am impressed to see how this grassroots Christian couple is burning for the Lord to carry on His mission and to accomplish His will on this earth. Their lives distinctly exemplify stewardship. Such people consider their lives as a gift from God and want to use all that they are and have for the glory of God and for the expansion of His kingdom. Although they earn money and enjoy every earthly blessing from God, their heart is predominantly set on God’s kingdom and His righteousness, not on earthly kingdom and worldly amusements. I take great delight and extract inspiration in watching such committed lives to the cause of Christ. However, I am also saddened to look at so many people who claim of being believers and followers of Christ Jesus, but as Paul said, they look out for their own interests, not those of Jesus Christ (Phi. 2:21). 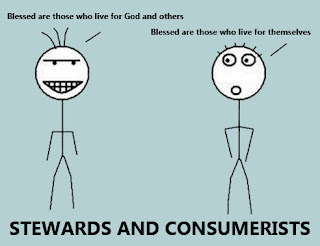 It seems many Christians are passionate to fulfill their own will and to build their own kingdom, unlike Jesus who taught us to pray, “Thy kingdom come and thy will be done.” They have given themselves over to consumerism Christianity, pursing earthly prosperity and seeking to attain material things to live a comfortable life. Regretfully, in all their carnal pursuits and worldly passions, they seek God to richly bless them, as if God is existing to serve them to fulfill their every whim. Moreover, to satisfy their conscience and to feel religious, they practice little spirituality [pray little, study little, worship little] and give little offering to church or ministry. But their lives are not evidently marked with a passion to follow Christ by denying self and carrying their cross, to spread the gospel of Christ, to make disciples, to help the needy & missions, and to build the flock of Christ which He bought by His own blood. Paul, in writing to the believers at Rome, exhorts, “Never be lacking in zeal, but keep your spiritual fervor, serving the Lord” (Rom. 12:11). Don’t you think many of our believers lack this godly zeal, spiritual fervor and passion to serve the Lord? The devil seemingly has become successful in making many of Christ’s followers sluggish in spiritual disciplines and distracted from God’s mission, but alert and zealous for worldly things. Is this not confirmed by looking at so many Christians whose lives are being enslaved by consumerism, materialism and hedonism? I am convinced there is a desperate need for revival, the great spiritual awakening, in our Christianity today. I urge you, dear believers of Christ, to think about the wonderful couple I have shared and examine ourselves with these questions - How am I living my life for Christ? What am I doing for God's kingdom? Is my life impacting those around me? Am I am a good steward of God's blessings in my life? Am I Christ-centered, kingdom-minded, gospel-oriented, people-builder and self-disciplined in God's ways? Let's commit our brief life on earth to live for the glory of God, walking with God by constant communion with Him and impacting lives around us by exemplifying God’s standards, by sharing the gospel, by making disciples, by helping the needy and missions, by encouraging the weak believers and by praying for the lost and for revival in Christian community. 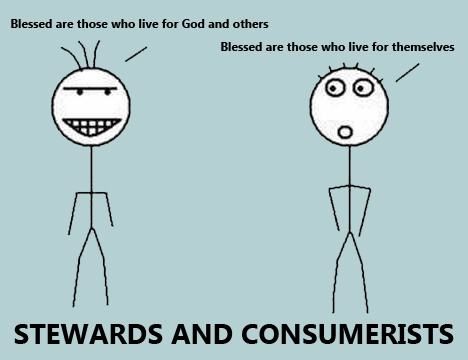 Such is a life lived worthily for the glory of God as faithful stewards in contrast to wayward consumerists.